I just had lunch with Alan Brady, the pioneering father of the Central Otago wine region in the deep south of New Zealand’s South Island. As Brady puts it, “…at 45 deg south it was a lonely place for grape growers when a few of us planted vines here in the early 1980s”. Brady is stopping overnight in Singapore on-route to Rome and will be hosting a dinner/masterclass at Oso restaurant, about right now. For a man who trail-blazed a fledging wine region with 27 vintages under his belt and the founder of the iconic wineries, Gibbston Valley Wines and Mount Edward, now in his mid-70s and still completely addicted to winemaking, he is incredibly humble and cuts a figure that belies his venerability with a verve and passion in his diction that you would think belongs to someone just starting out in wine industry and bought their first vineyard. Actually, it’s not far from this as Brady’s false start to retirement in 2005 and suffering major winemaker withdrawal symptoms he struck a new label the following year, “Wild Irishman” (yes the name says it all) and now in its 7th vintage, this is looking nothing like a man who has ‘stopped to smell the roses’. 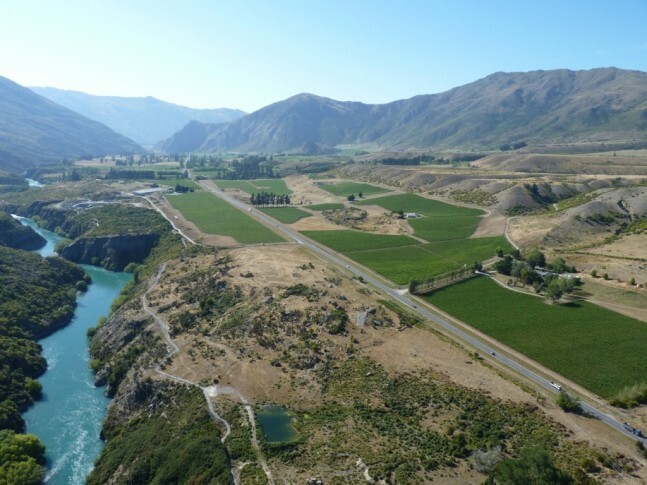 The thing is the Central Otago has only just started to bloom with the palpable realisation of sub-regional complexity and that whiff of a truly defined and diverse terroir, the region is only just reaching its potential, and Brady senses it, and can’t stand the thought of missing out on the epoch. There’s a whole lot more I want to write on Brady’s heritage and the continued ascendency of single-vineyard, sub-regional wines of Central Otago, but I want to get this appetizer out now, before all the wines is sold out – at tonight’s wine dinner. The urgency is simple, Wild Irishman Pinot Noirs are produced in miniscule quantities, read 150 cases of each wine and only a thimble available here (Singapore) through Wine Exchange Asia. Having just tasted his Gibbston and Bannockburn Pinot Noir cuvees from 2009, 2010 & 2011 there is a particular wine, the 2009 Wild Irishman “Three Colleens” Gibbston Pinot Noir that is unbridled, untamed, uninhibited pure luxuriant, sensual pinot noir of the most profound complexity, even Brady himself was taken aback, having not seen the wine for over a year. Brady himself would dearly love to buy some back, as Wine Exchange Asia have been holding on to this for a couple of years, all 3 cases of it, which is more than what Brady has in his own cellar. The 2009 vintage which was low-yielding, long-ripening and the benchmark in the region for concentration and balance, in an area that disbelievers believed was too marginal to grow grapes successfully. It is most certainly the extreme of pinot noir, in the most southerly planted vineyard region in the world, the Gibbston Valley markedly cooler than anywhere else in Central Otago and this single-vineyard planted at 500 metres above sea level with the Kawarau River raging 250 metres below – the harvest is at least 2 weeks later than in the warmer Cromwell Basin just 15 kilometres away. It is a truly unique and RARE wine, moreover one of the most profoundly complex and silky, soft pinot noirs I have come across in New Zealand. Already showing captivating secondary aromas of tobacco, tealeaf and balsamic nuances, there is a beguiling richness and sensual sweet perfume of red berry fruits amongst a heady spiciness and funky characters – parmesan cheese, lactose and a whiff of down on the farm chook shed – all those wonderfully seductive pinot noir complexities. An ethereal suppleness defies the power and concentration of fruit and dry extract building up to invigorating wine with considerable super-fine tannins; in a region that is not known for such, this is profoundly intense pinot noir with a lingering spiciness and a melange of tobacco, dried herbs, balsamic, dried tamarind and a silky, rich mouth-filling sweet concentration of red berries. A veritable bargain at S$65 bottle. You will need to raise your hand straight away if you want some of this, and I would email Lou at Wine Exchange Asia RIGHT NOW, lou@wineexchangeasia.com as I know he has the Blackberry at the ready. I would also be securing some of the 2011 “Three Colleens” which has all the hallmarks of the 2009 but will need a good 4 years or so in bottle, even if it is thoroughly seductive already. I’d like to right more on the Bannockburn cuvees which are equally good in the distinctive, bolder and richer style the region is known for and I would suggest there will be those who will find these even more attractive than the Gibbston cuvee – but for those pinot noir addicts out there, you simply must grab a few bottles of the 2009 “Three Colleens” – it will convert you to Central Otago Pinot Noir forevermore.